Steve has completed the retaining walls up to the steps outside the sliding door behind the house. We are so pleased with how it's turning out, and Steve is happy because the hardest part is done. I had a lovely morning yesterday, and went to town on my own to visit, for as long as I wanted, two garden nurseries and did a buy up of plants for out the back. 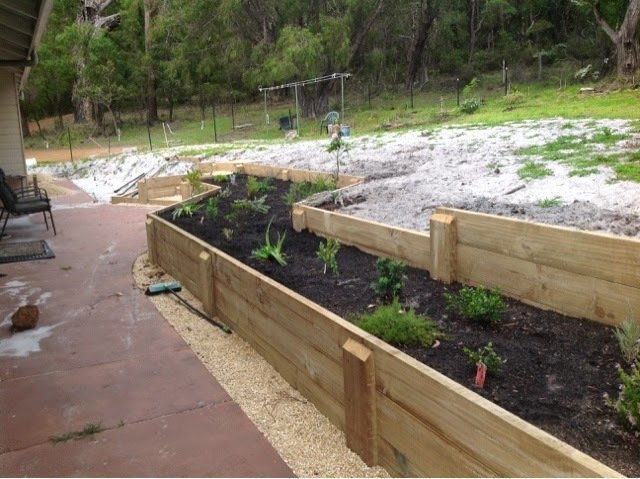 Such fun :-) Today was hard slog as I planted a good many of the plants, consequently I am sitting here in my jarmies at 5pm with a hot pack on my back, worn out!